Frost is in the air! With winter coming some owners of historic places might be witnessing the formation of frost on their single pane wood windows and storms, most notably on the second storey. The reasons for this will vary and subsequently so will the solutions. Generally speaking, a little frost now and again should not harm the window frame but a more persistent formation will saturate the surrounding material and in the long run, potentially cause significant damage. Should this be the case, ignoring the situation is far from the recommended solution. Frosty window. Note the closed storm window vent cover. During the winter it should be open. So what is one to do? The first step, as with any intervention on a historic place, is to develop an understanding of the problem. What is causing frost to form on the window? The answer: warm moist air comes in contact with the cold glass and condenses, which then freezes on the surface. So how does one mitigate this? Should you let the house freeze so that the interior temperature matches the outside, or should you turn the house into an oven to eliminate any and all moisture in the air? Obviously, neither scenario is plausible. So what is one to do – replace the windows? Speaking from a heritage conservation perspective, replacing authentic historic windows would be the equivalent to someone shaving their head bald because they found a grey hair. Historic windows have, in my experience, proven themselves to be longer lasting than any modern window and can continue to serve their function with proper care and maintenance, while modern windows wear out and routinely need to be replaced. As air moisture is the general cause of frosted windows, controlling it would appear to be the most appropriate approach. However, there is more than one way to control moisture during the winter. One can control moisture levels with a dehumidifier, or by preventing it from reaching the cold glass with weather stripping techniques. As well, one could better manage the presence of moisture with exhaust fans and insulation. Any combination of these efforts will help to reduce the frost on windows but it should also be noted that there are pre-existing systems that should be taken advantage of in regards to this problem. Storm windows traditionally have three holes at their bases with a flap cover. During the winter, these should be open to let moisture and condensation escape. When bugs arrive with spring, close the flap. Double hung windows generally have locks where the sashes meet, use them to tighten the window and reduce air leakage. 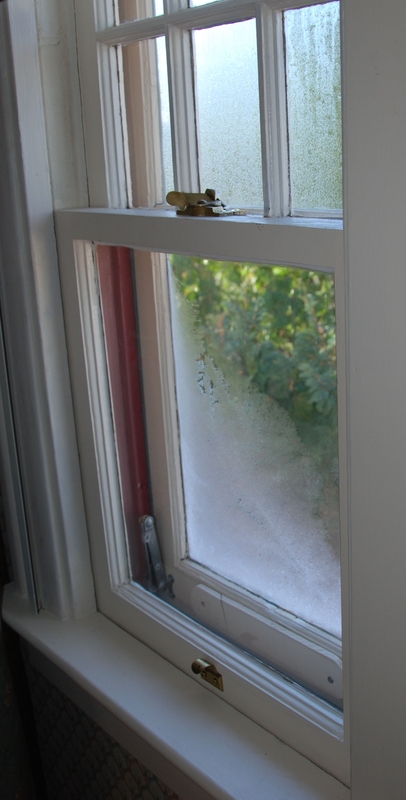 Should you decide to proceed with a form of weather stripping, concentrate on the interior side of the window and allow the storm window to breathe. This will create a micro climate (similar to the ventilation in one’s roof), which should help prevent frost and therefore better sustain and protect the window. Hopefully, the preceding information will be useful for those who might be dealing with frosty windows. There are many articles on the Internet, which tackle this issue and propose similar, different and additional solutions ranging from “free to expensive”. As a Heritage Conservation Adviser, my advice and that of the Standards and Guidelines for the Conservation of Historic Places in Canada, is to start with the minimal approach. With any luck, that is all that will be needed. If you have any technical questions related to the conservation of your historic place, submit a comment in response to this post. We would be happy to prepare a response. One week left before registration closes! Municipal Heritage Forum 2012 is the annual opportunity for municipal leaders interested in the conservation of locally significant historic places. If you are a municipal heritage planner, heritage advisory board member or councillor we encourage you to sign up today! – Our keynote speaker, Julian Smith, Executive Director of the Willowbank School of Restoration Arts, will explore the theme Place Matters! by sharing his perspectives on places and spaces. meet and discuss your ideas, questions and concerns about municipal heritage conservation with Municipal Heritage Services Officers Michael Thome and Brenda Manweiler. – Several of Alberta’s municipalities with active heritage conservation programs will present aspects of their programs. Learn firsthand how local heritage is being conserved! a template bylaw for Municipal Historic Resource designations. On Tuesday, October 16, 2012 the Village hosted on open house, inviting the owners of properties that had been documented and evaluated in the Municipal Heritage Survey and Inventory project, and any other interested residents. The attendance numbers and interest exhibited revealed an engaged community. Congratulations on a successful open house! 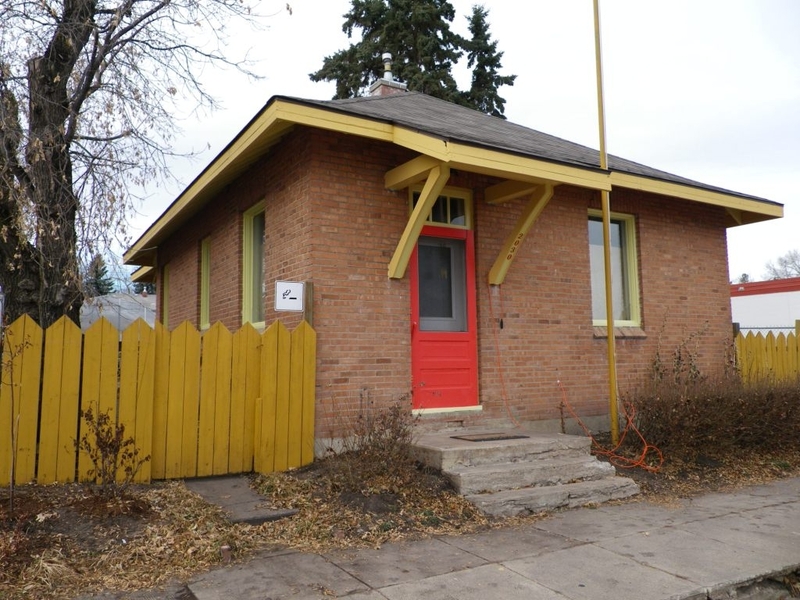 Cost-shared funding assistance for this project was provided by the Municipal Heritage Partnership Program (Alberta Historical Resources Foundation). If your municipality is interested in developing a municipal heritage conservation program please contact Municipal Heritage Services. 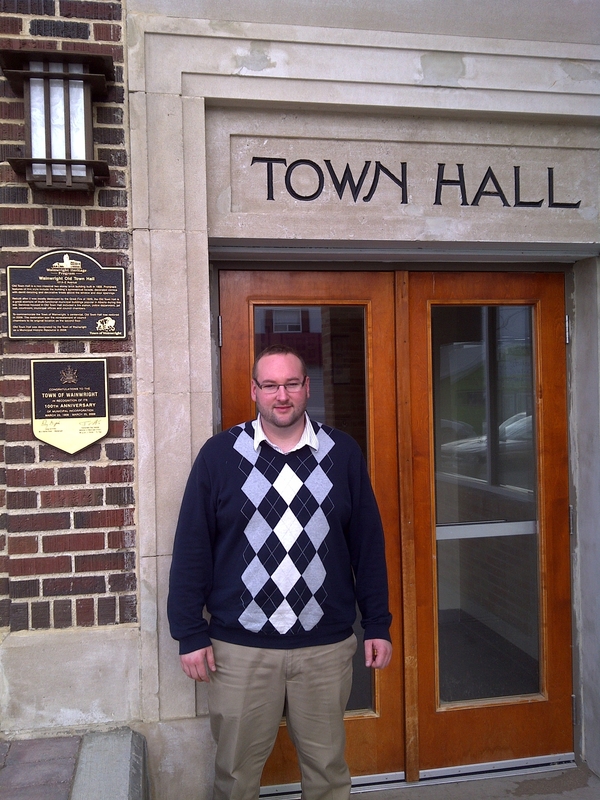 I spent a day in the Village of Delburne earlier this month, training the village’s new heritage advisory board. They plan to survey buildings and structures in the village over the next six months, or so. They also plan to do some oral history work with local citizens and use all this information to develop a walking tour and some interpretive plaques. Delburne is preparing to celebrate the centenary of the village’s incorporation, in 2013. I do all sorts of heritage planning projects with Alberta’s municipalities, but while preparing for this workshop I was struck by how few municipal heritage surveys I have worked on recently. Delburne’s project has reminded me just how useful heritage survey’s can be. A survey helps a municipality identify buildings and structures that may be significant, providing a basis to determine which places to evaluate further. The first step is for a community to select a geographic area to be studied. (Delburne is compact enough to be surveyed in one go). The survey team does some research to locate buildings and structures built before a cutoff date (usually 40 years ago). A fieldworker photographs each place’s facades (from the sidewalk and alley) using black-and-white archival-quality film. They will also make notes on each place’s design and general condition. This is combined with some historical information explaining how the building has been used over time. Together, this information forms a survey record. The survey records are entered into the Alberta Heritage Survey database, part of the Heritage Resources Management Information System (HeRMIS). Each survey record is a snapshot of Alberta’s streetscapes and farmyards, showing us how they have evolved over time. The database can be searched in all sorts of ways—you can look for places made of a particular material, buildings that have certain design features and/or places associated with people or events. The survey in Delbure will provide a sense of which places may be sufficiently significant to warrant further study and evaluation. Municipalities may choose to evaluate some of these places for heritage value, eventually develop management policies and possibly designate several places as Municipal Historic Resources. A tried and true way to recognize your locally significant historic places is with a lasting physical acknowledgement of some kind or another. So it is not surprising that for at least 140 years, communities around the world have used plaques, such as English Heritage’s renowned “Blue Plaques, to celebrate the heritage of a place. Here in Alberta, we have had our own “blue plaques” to mark Provincial Historic Resources. In addition, a number of municipalities have gotten into the act. Since 1978, the Historical Resources Acthas given local governments in Alberta the power to legally protect significant properties at the local level, through a bylaw of council. These Municipal Historic Resources carry the same level of legal protection as provincially designated properties, but with local heritage values in mind. Here on RETROactive, we would like to begin to showcase some of the plaques and plaque programs that have been developed by municipalities around the province. To start with, I’ll just post a few pictures of locally-developed plaques that I have seen on my travels around Alberta. Perhaps these might inspire your community to designate and recognize some of your own locally significant historic places. 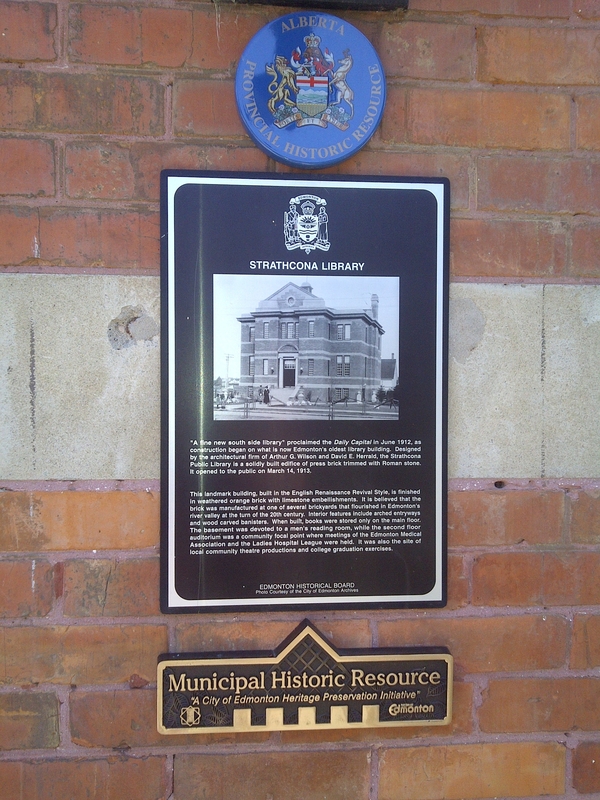 If you have pictures of plaques for other Municipal Historic Resources in your community, please feel free to email them to me at Matthew.Francis@gov.ab.ca. 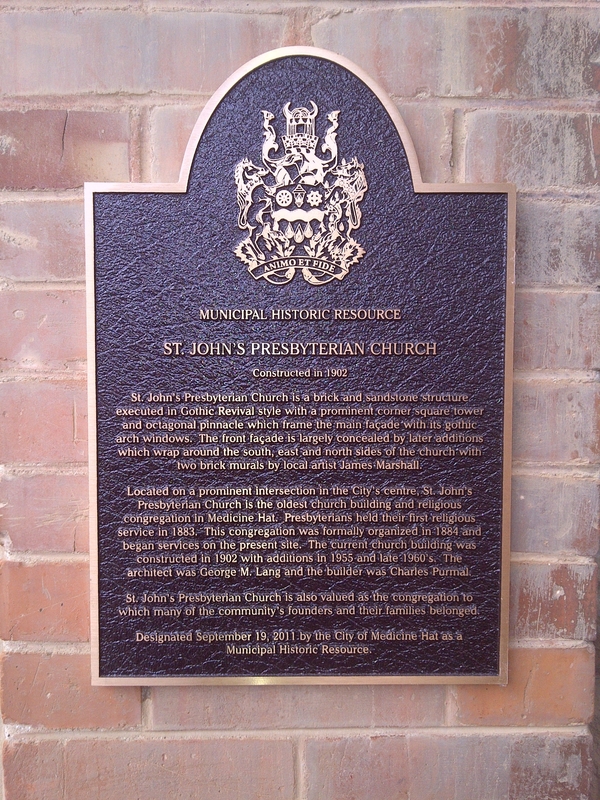 We will regularly feature some of these plaques and the meaningful historic places they recognize here on RETROactive, your blog for Alberta’s historic places. 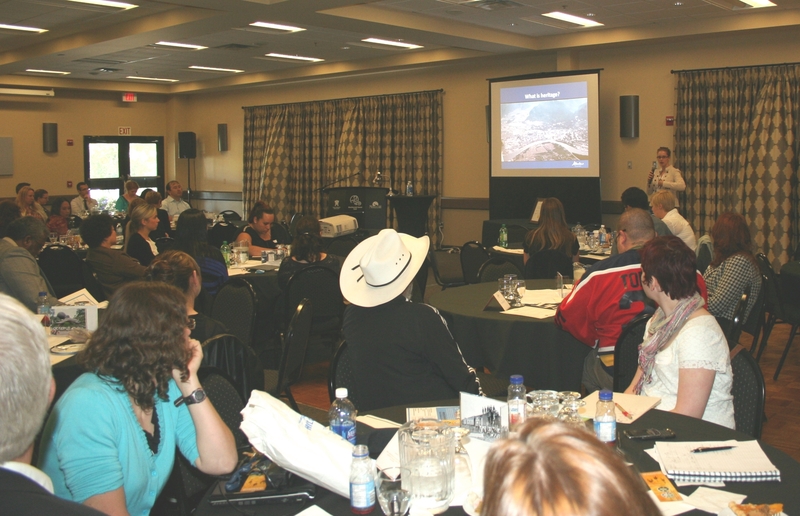 On Thursday, September 20th I was invited to participate in the Regional Municipality of Wood Buffalo’s Vibrant Culture Summit up in Fort McMurray. Attended by approximately 85 area residents and culture enthusiasts, the event sparked conversation about how to enhance local culture. The day began with a keynote presentation by Gord Hume. As a former municipal councillor and author, he spoke about cultural planning, creative cities and how culture – when combined with economic, social and environmental factors – can produce dynamic, sustainable communities. Three panel discussions and various roundtable questions completed the day. Attendees listening to my presentation on heritage conservation. Panel One featured the City Centre Area Redevelopment Plan. Attendees were able to glimpse the sights and sounds intended for a revitalized City Centre. The arts and other cultural pursuits are central components in the plan. Panel Two served as an update on the creation of Arts Council Wood Buffalo. Established in February 2012, the Arts Council will work with regional arts organizations to strengthen and promote arts in the area. Panel Three was all about HERITAGE! Jack Peden, Vice President of the Fort McMurray Historical Society, spoke about early river travel in the region, which is a significant aspect of Fort McMurray’s history as the confluence of the Athabasca River and the Clearwater River is located in town. He also featured some of the restored vessels that now call the Fort McMurray Marine Park Museum home. yes, a historic place can also be a 160’ steel hangar built in 1953 and located at CFB Cold Lake. These and other places, despite being relatively “new” and void of boomtown facades, ornate columns or other elements of traditional architecture can still be historic places. Historic places can be pretty or gritty, modern or traditional, modest or ornate, representative or symbolic…. Historic places reflect a community’s evolution – they help to tell the story of how a community has evolved into its present form. It is through the conservation of these varied places that a community’s unique identity is celebrated, enabling the community to be some place, somewhere as opposed to any place, anywhere. I was very pleased to speak at the Vibrant Culture Summit. I appreciated the opportunity to learn about the cultural successes and challenges occurring in the Regional Municipality of Wood Buffalo thereby allowing me to better understand the region’s varied heritage. As a Municipal Heritage Services Officer I spend much of my time travelling Alberta meeting with municipal heritage stakeholders. Typically, these meetings are specific to heritage conservation as I advise municipal administration in their development of local heritage conservation programs, present information to councils on our Municipal Heritage Partnership Program, or provide specialized training on municipal heritage surveys, inventories and management plans to Heritage Advisory Bodies. Occasionally – and quite happily – I get the opportunity to speak to a wider range of community stakeholders, and be reminded that heritage conservation is but one aspect responsible for enabling vibrant and sustainable communities. Thank you, Regional Municipality of Wood Buffalo, for offering me one of these opportunities! Municipal Heritage Forum 2012 (November 8th and 9th) will feature a broad range of concurrent breakout sessions designed to inform and inspire. Keynote speaker Julian Smith will describe his “Top Ten Favourite Places in Canada,” and why they are significant and meaningful. Come gain a new sense of perspective on spaces and places from our resident expert, and enter into a conversation about heritage values – both local and global. 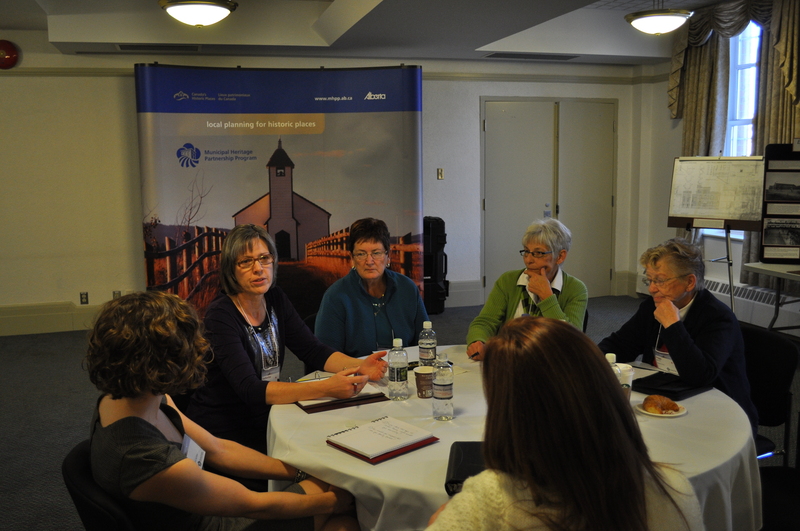 Calgary’s heritage community gathers at the “Community Heritage Roundtable” to socialize, hear snappy presentations, and share information on heritage issues. Run on no budget by a volunteer committee from a spectrum of heritage-related groups, quarterly events routinely attract more than 100 people, and the Roundtable has developed a contact list of more than 700 emails. Learn how this forum, now in its sixth year, is a gateway for people to connect with heritage, an incubator of heritage initiatives and a “force multiplier” for heritage advocates. Get inspired to start a heritage forum in your community! Century Homes Calgary is an incredibly successful grassroots project that engages people to celebrate houses constructed during Calgary’s first big building boom, which peaked 100 years ago. Inspired by “If This House Could Talk”, a similar project first created by residents of Cambridge, Massachusetts, it attracted over 500 participating households in its inaugural summer of 2012. Owners and residents of century-old houses sign up to display a specially designed garden flag, research the history of their homes, and create and display home‐made signs telling their part of Calgary’s story during Historic Calgary Week. Legacy projects are planned that will leverage the huge network of heritage home owners and advocates. Find out how this participatory heritage project can be replicated in your community! The Standards and Guidelines for the Conservation of Historic Places in Canada are a key tool used in making conservation decisions and alteration approvals for historic places. This classic presentation by Tom Ward, Manager of Heritage Conservation Advisory services is packed with examples and practical know-how. If you have not had training in the “S&G’s” before, this is your chance! If you have, you may just learn something new by attending. Municipal Heritage Services staff – Michael Thome and Brenda Manweiler – will be available to talk with you about whatever municipal heritage issues are on your mind. Want to find out how to conduct a Municipal Heritage Survey? Ever wondered why your community should have a Municipal Heritage Management Plan? Come with your questions! Geographical names, or toponyms, serve an integral role in our society. On a practical level they provide reference points, allowing us to easily orient ourselves within our surroundings. However, geographical names are more than just labels on maps; they are a cultural legacy. They can tell us about our history and the values of previous generations. They can reveal trends in exploration and land settlement, resource use and cultural development. They provide us with a sense of both place and time. How we name places and what names we choose for them offer a glimpse of the values held by previous generations and they are a sacred trust that will inform future generations about our values. Join Ron Kelland, coordinator of the Alberta Geographical Names Program as he explains why place names are important, how names are adopted and what can be done to preserve our geographical naming heritage. Did you know that Alberta Culture, through the Historic Resources Management Branch has a specific program area that works with Aboriginal communities to help preserve and protect their cultural heritage sites? Aboriginal Consultation Advisor Valerie Knaga will be available to give you all the information needed to increase your awareness of how this program area may be able to assist communities. Are you interested in heritage districts or areas? The City of Edmonton is working on creating and defining a unique heritage district in the inner-city. Come hear Heritage Planner David Holdsworth showcase the unfolding process behind the “Church Street” project. Let’s face it, it takes resources to properly steward historic places. The Alberta Historical Resources Foundation has a number of funding programs and categories, which can help support heritage work. Grants Program Coordinator, Carina Naranjilla, will walk you through the Foundation’s grants and answer your questions. Medalta, Medicine Hat’s Historic Clay District is a National Historic Site of Canada and a Provincial Historic Resource. It is also a museum and increasingly a world-class destination in its own right. Hear from Executive Director Barry Finkelman about how Medalta is leading the way in cultural tourism for historic places. Interested in attending Municipal Heritage Forum 2012?